Temporarily out of stock & unavailable for order. Check back soon! The SMOKTech Vape Pen PLUS Starter Kit is a all-in-one starter kit that is designed for vapers looking for a ultra portable pen style vaping setup. 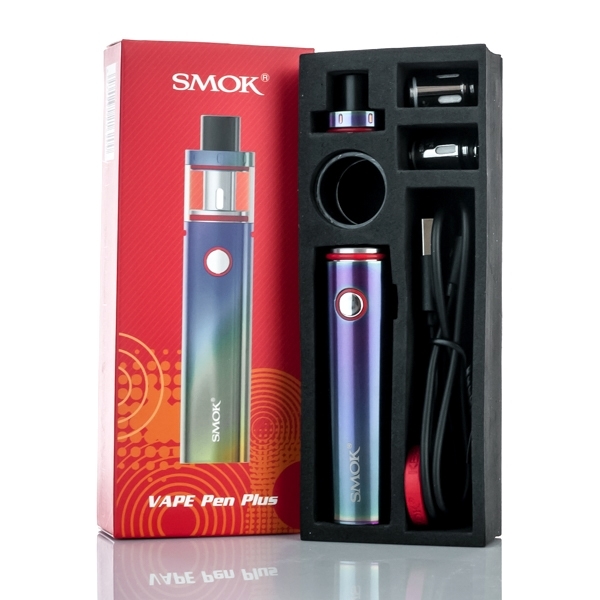 This is considered to be a larger and higher capacity successor to the slimmer SMOK Stick Vape Pen 22. The SMOK Vape Pen PLUS features a 24.5mm diameter and a large built-in 3000mAh internal battery that utilizes direct output voltage. The Vape Pen PLUS features a improved top fill screw off design for easier and cleaner refills. It also features a larger refill slot as well. The Vape Pen PLUS features a simple one button design with an intelligent battery life indicator. The Vape Pen PLUS features dual airflow slots for an ample amount of airflow and vapor production. The Vape Pen PLUS is charged via the micro USB port with the included micro USB cable. There is no need to adjust the wattage or fiddle around with settings with the SMOK Vape Pen PLUS.